With the Wii U hitting the market at some stage in 2012, and with Sony and Microsoft likely to announce succeeding machines at E3 next year (with launch windows around 2013/2014 if the rumour mill is any indication), it’s time to talk risk management. But not boring textbook risk management – fun console risk management. When I talk about this concept from a console perspective, it’s probably not in a way that most expect. The way I’m approaching the application of this phrase to the gaming arms race is about how to build a console so that it is as risk-adverse as possible, and what the consequences of “bad” decisions are from a managerial perspective. Let’s take the Wii as the first example. The Wii made Nintendo a lot of money, more money than it was probably expecting. It now makes them less money compared to the machine’s heyday. Nintendo made, from a nerdy perspective, a few errors in judgement that arguably affected the console. First up, the console was region-locked. This seems inconsequential to the average pundit, but consider this – in order to play a game you’ve purchased overseas, you need to mod your console with either a modchip, boot disc or softmod. Thus, instead of just the tinkering masses who want to get Linux on the machine and the pirates, you also have every legitimate gamer who wants the flexibility of importing games, whether the rationale be price, features or release dates. Open the machine up and temptation may come into the equation. Under Australian law, it also adds a degree of legitimacy for console modding – the ACCC is happy to weigh in on the argument and support console mods that allow imports; if said-mod also enables piracy, that’s collateral damage. The legislation was never tested post-PSone, but the principles are more difficult to argue given past precedent. There’s also the question of global communal resourcing behind the modding effort – in the case of the Wii you have the Linux community, pirates and gamers all clamouring for a solution. If Nintendo had made the machine region-free and allowed a Linux distro from day one, you eliminate a reasonable portion of the white-hat community. There were also a couple of other errors of judgement – Virtual Console games were always in 50hz for PAL countries. This defies logic, at least in the realm of English-speaking PAL countries where a US version would have been fine. I have outright refused to buy PAL VC games given such anti-consumer attitudes; same goes for PAL PSN by the way. Admittedly I account for 0.01% of the audience, but still – why make a stupid move? Then there’s Nintendo’s lack of QC on titles and the subsequent neglect of the system by gaming enthusiasts. Yes, we’ll all jump on board the delightful Zelda train now that Skyward Sword’s out, but the emphasis on mass-market profiteering enabled a relatively short-term success for the machine. Attachment rate was low, third parties faced the dual-issues of piracy and poor sales lost amidst a swamp of shovelware and core gamers have generally let the machine gather dust. On the upside, Nintendo profited handsomely from hardware, accessories and licensing on every piece of software sold, but the focus was worringly short-term. The PS3 and XB360 hailed from the same launch window and are still performing in the marketplace due to strong software development and long-term hardware/software development (the former has had to work extra hard to get to its current place). Nintendo’s usual internally-focused attitude was it’s usual double-edged sword – a Nintendo product is made to play games by Nintendo; 3rd parties are welcome to join the ride, but ultimately they play second fiddle to first party titles. It’s no longer the 16-bit era though, and one hopes the attitude will change with the next generation. Don’t get me wrong, I love our Wii. But a few critical flaws affected the machine. In a sensible world, the Wii U would capitalise on its apparent grab to enamour the core gamer beyond a few mature launch titles. It should also give great BC with Wii software and GCN software; unfortunately, the latter is being ignored (likely a DLC double-dip for Nintendo) and the former will only be played back at SD resolutions. Like the Chewbacca defense, this decision makes no sense. Wii games internally rendered at 1080p look stunning – Dolphin has demonstrated this. Why this isn’t done is irrational – I’d happily pay $5-$10 to buy an enhanced emulation mode off the online store assuming it gave all the nerdy love you’d expect. It’s a bad omen for a company that should be learning from its mistakes, rather than continuing to implement half-arsed measures to bring back in the bread and butter of their fanbase. As for region-free? Not sure if anyone has discussed it, but I’d suspect not given the also-irrational moves to make DSi and 3DS titles region-locked. In a global economy, you can’t have your cake (utilise a global consumer base to promote your product) and then eat it too whilst kicking the other person in the face (creating artificial and unnecessary delays for release, engage in price-fixing between territories and locking out the option for the consumer to parallel-import titles). Then there’s the Xbox 360. The predecessor was clearly Microsoft’s trojan horse (though the Dreamcast fanboy within suggests the Dreamcast was Microsoft effectively experimenting with the console market), so the XB360 was MS playing for keeps. Despite enormous effort to court the Japanese industry, the machine still flopped in the Land of the Rising Sun. Not that it mattered in the end – the gaming sector in Japan has effectively imploded and allowed North American development to rule the roost with a minor resurgence in the UK and EU (and a welcome one at that). Microsoft made a couple of good moves with the XB360 – it looked less of a black brick compared to the preceeding console, had some interesting games with more contributions from Japan (especially on XBLA), didn’t kill BC as part of the console’s hardware revisions and set region-locking as an optional requirement set by the developer. It was also relatively easy to develop for and often had the best version of multiplatform games. Unfortunately MS also paired the machine with overpriced proprietary HDDs, kept DVD (though this did have speed benefits vs BRD/HDDVD) and have absolutely terrible engineering on the insides that have resulted in the least-reliable console ever built (citation needed). Region-locking was inconsistent – some titles were good to go, some weren’t… and unfortunately, some key titles were region locked (I’m looking at you Tales of Vesperia!). Oh, and dead DVD-ROMs meant if you tried to DIY a replacement (instead of paying through the nose for MS to do the work for you), you could get banned from XBL. There of course is little chance of MS ever supporting a Linux install, but extending the machine’s media playback abilities would have been a nice step. So that brings us to Sony. The PS3 was on the edge of greatness with their machine from a nerd perspective (apologies for the hyperbole) – excellent BRD playback, evolving media playback, DLNA compatibility out the box, standard HDMI and optical audio sockets on the machine, excellent BC, Wifi as standard, region-free for PS3 titles and all content from PSN, Linux installs available from day 1, reasonably reliable hardware and the ability to upgrade HDDs yourself. This is amazing considering Sony’s arrogance coming into this generation as the previous market leader. However, Sony made a few critical errors. BC was gimped in PAL territories from day one (despite paying an extortionate opening price for the machine), and then completely removed altogether. Media playback was successively updated up until… ~fw 2.45, and then it dropped off the radar. Wireless performance for streaming media has been lacking for a while now – again, following a firmware update a while ago, wireless streaming performance slowed down for some reason. PSN has been poorly utilised for distributing PSone games (and now selected PS2 titles), including the reappearance of poor PAL conversions on PAL PSN. PS2 BC was completely removed from the second major hardware revision (but interestingly is now back as a possible emulation layer with PS2 titles via PSN) and PSone emulation has lacked any kind of enhancements the PS3 is more than capable of. The Big One, though, was the removal of Linux. Depending on which argument you sit with, this was the tipping point that led the collective hacking communities to proceed with breaking open the PS3. From a risk management perspective, this smacks of trouble – to use a possibly inappropriate analogy, if you go into town on a Friday night, get drunk and pick a fight you shouldn’t be surprised someone will punch you in the nose; it certainly isn’t a legitimate excuse, but partaking in that kind of behaviour certainly lacks a risk-adverse attitude. Up until that point the PS3 was relatively robust – it wasn’t being affected by piracy in the same way the Wii, and to a lesser extent the XB360, were and broadband penetration meant distributing 25gb+ files wasn’t entirely practical. However, in the wake of removing Linux the community took the gloves off and the platform suffered as a result – both in terms of the platform’s physical integrity but also the security of the company’s entire online framework. I’m not condoning the behaviour of the hacking community by the way, just pointing out that from a risk management perspective, in hindsight it wasn’t a sensible move. So, lessons to learn for Sony? Keep the progressive things about the PS3 into the succeeding console – region-free playback, excellent media playback, Linux from day one, user-maintained HDD, standard media sockets (i.e. HDMI). To the average punter, the likes of Linux support, BC, media playback and region-free gaming probably aren’t high on the list; to the core gamer though, these are important issues. More than that though, fulfilling these requirements will assist in reducing the risk associated with the platform from the hacking community. It certainly demands a very different attitude towards your end-user compared to the approach console manufacturers have traditionally taken. Whether or not this kind of progressive attitude pays off is anyone’s guess – what’s the ROI for goodwill? Or perhaps it’s better to phrase the question like this – what do you have to lose if you raise the ire of your consumer-base and all corners of the hacking community? Dragon Quest 10 is online-only… huh? 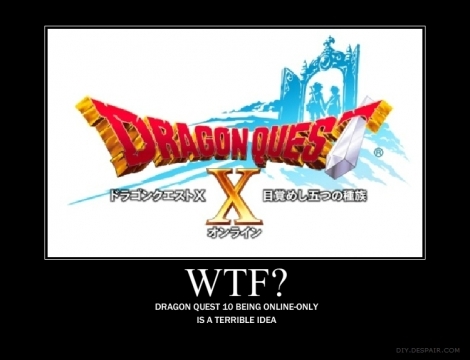 Comments Off on Dragon Quest 10 is online-only… huh? Yes, I’m late to the party, but thought I’d post about it anyways. I’m not the world’s longest-serving DQ fan, but I respect its history and that it, in many ways, embodies the spirit of JRPGs of old without making everyone beautiful, androgynous and full of clich&eaccute;d angst. I don’t think I’d be as fussed if the game was going online as a side-story to the main series, kind of like Phantasy Star Online/Phantasy Star Universe or FFXI/FFXIV. MMOs and Diablo-clone MMOs have their place, but they don’t interest me all that much, as I prefer single-player JRPGs, particularly when they have blue skies and are jolly. Or are simply fun. The only exception to that was the original PSO releases (especially the GCN port with 4-player local coop), which was great fun back in the day. For me, moving DQ10 as an online-only game seems… silly. I’d rather a shinier coat of paint and an interesting storyline. It also limits the accessibility of the game if you go back and play it once the servers get pulled. Mind, the problem is that JRPGs (with a few exceptions) have languished over the current generation as Japan has shifted development priorities owing to cost and the changes in Japanese gaming demographics. Economic rationalism has also encouraged developers to play it safe rather than get too carried away or ambitious. So, while some of the JRPGs have been fun, the quantity/quality from the last couple of generations hasn’t been matched. At least in my opinion, but I’m old and stuck in my ways. So, my opinion should of course be take with a grain of salt. After all, I’m still whinging about Grandia getting passed up on the Saturn. Still, there is some hope – Valkyria Chronicles married some superb characterisation and story-telling that echoed Kodama-inspired epics like Skies of Arcadia and Phantasy Star 4 in the guise of a strategy RPG, Monolith has reminded the world of what made JRPGs great to begin with in their amazing Xenoblade Chronicles, and Ni No Kuni looks so sumptuous that I dare to dream that it will bring a 90s-Miyazaki/Takahata soul to the world of JRPGs. In a perfect world, it will also be bilingual as part of the English localisation, much in line with Valkyria Chronicles and Xenoblade Chronicles. Should the time come for DQ11, I can only hope it brings back the single-player focus with all the soul its renowned for. Including the Toriyama-requisite of spiky hair. Sega announces Monster World IV is getting an English release! Comments Off on Sega announces Monster World IV is getting an English release! 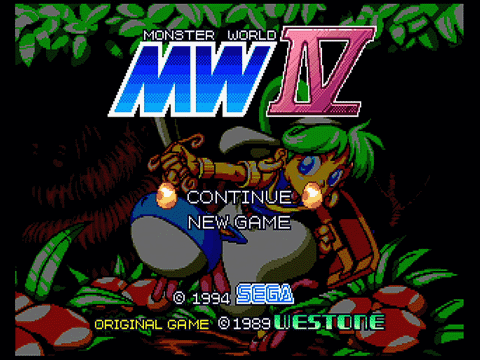 Read this over at Silicon Era – Sega have announced they’re going back and translating Monster World IV, previously only available in Japanese (though a fan translation exists that can be patched to the Japanese version), and are releasing it on Wii, PSN and possibly XBLA. This is phenomenal news given the age of the game and the perceived lack of mainstream interest. This is is the stuff of fanboy dreams and legends, and it is amazing to see Sega leading the way. From here, my only hope is that they get M2 to develop the emulator for the PS3/XB360, as previous emulators have been absolutely terrible on the machine in comparison to M2’s work on Nintendo’s Virtual Console and the Sega Ages collections on the PS2. You can check out the full release over at the Sega Europe blog. US release of Sakura Wars: So Long, My Love (Sakura Taisen 5) features Japanese language!! Because I’m a bit of a random individual, I just had a thought – any word if the upcoming US release of Sakura Taisen 5 (Sakura Wars: So Long, My Love) on the Playstation 2 and Wii by NIS had confirmed the dubbing options? And lo and behold, a quick look on one of my fave video gaming blogs Siliconera had all the info (see: Sakura Wars: So Long, My Love Sold As A Two Disc Box Set; and Sakura Wars: So Long, My Love Slips Into Next Year), as well as an updated release date for the Playstation 2 release (Wii, too) – early 2010. This is a startling moment of clarity, and a wonderful surprise for fans of the series and the world in general (I exaggerate not). I’ve been playing Sakura Taisen since the Saturn days and absolutely love the games (the anime releases, with the possible exception of the TV series, are also extremely good), but was always frustrated that I had to use my rubbish understanding of the Japanese language when playing through any of the games 😉 Well, I normally had a FAQ sitting next to me, but still, translated text would have been super-awesome 🙂 I blame Bernie Stolar for not bringing it over to the West in the mid-90s, even though it would have arguably been financial suicide (though it’s not like the Saturn was a particularly successful business venture in the West tbh – great machine though, still my favourite system). Anywho, the news of there finally being an English translation of this game being brought into the West was pretty huge in and of itself, but the fact that they’re doing a 2-disc release in order to preserve the original Japanese voices and please the ignorant masses with a dubbed release (seriously – it’s a foreign language, it’s just like watching a movie subtitled, because English dubs for movies should also be banned – deal with it), which ultimately creates a harmonious solution. I know there are additional costs going down this path for developers, I just wish it happened more often where there isn’t enough space to make a release bilingual on a single disc. … erm, I got sidetracked. So, to re-cap – Sakura Taisen 5 is getting an English language, is preserving the original Japanese dialogue on its own, separate disc, and will be released in early 2010 by NIS. 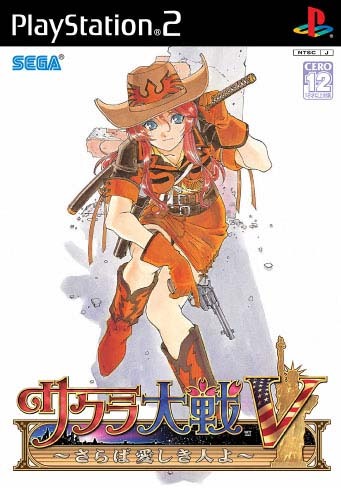 Oh, and anything Sakura Taisen is awesome. The end.